Learn how to use NewLook’s Endura Concrete Stains to enhance your existing or old concrete. This will give you an overview of what needs to be done to properly install the Endura Concrete products. For best results, you need to thoroughly prep & clean your surface. Remove all loose particles from the concrete using a broom. Scrape off any particles that may be adhered to the concrete. For best adhesion remove previous color or sealer using EasyStrip 1000 or EasyStrip 2000. Apply a thick, even layer of EasyStrip onto the coating being removed. The desirable thickness of EasyStrip is approximately two times the dry film thickness of the coating. Minimum thickness should never be less than 15 mils (wet film). An airless spray machine is the most effective means for application. Use a tip size of 700 microns (.019) or larger. Brushing and rolling produce lower film builds, requiring additional applications, resulting in longer strip times. Once applied, leave the product alone, as agitation slows down penetration. Do NOT allow EasyStrip to dry out, the stripper is designed to remain wet. If dried, re-emulsify EasyStrip by applying additional product. If necessary, remove the lifted layers, discard and re-apply. Removal of lifted coatings can be completed by scraper, squeegee, wet/dry vacuum suction system, or by high pressure (2,500-3,500 psi) pressure wash. If pressure washing is used, protect all areas that may come in contact with stripper residue. Apply 3in1 PREP on dry concrete with a brush, mop, or spray. Agitate 3in1 PREP with a hard bristled brush. Allow it to rest on the surface for 15-30 minutes. Be sure not to let it dry. To avoid premature drying of product, apply during cooler temperatures or apply a thicker coat. FOR BEST RESULTS: apply when temperatures are between 50F & 90F. 3in1 PREP neutralizes with water so it is safer to use around plants and grass without causing damage. If you are concerned about the plants and grass, then use a hose and wet them down before applying 3in1 PREP. Use a 3000 psi pressure washer or higher to thoroughly rinse the surface. Allow the surface to dry, then perform a water test. A water test consists of pouring water on the dry surface. If it sits on the surface and takes more than a minute or two to soak in then consider applying another round of 3in1 PREP. Once the surface is dry, please go ahead and get to staining the surface. Start by masking off the edges with tape and plastic up the of walls in order to prevent overspray onto walls. When using a brush or roller, brush in a figure 8 pattern. For full opacity apply a second coat after the first coat is dry. To test if the surface is dry, perform a wet rag test. Endura Enhancer Semi-transparent concrete stain can be sprayed, brushed or rolled onto concrete. With Semi-transparent you can get a number of different looks including faux acid look and an antique finish. Apply stain in various intensities with random motions to mottle the color. One or more colors may be used wet on wet to achieve a color fusion. Stain may be applied with an HVLP sprayer or placed on smooth surfaces with microfiber pad in random motions. This a specialty semi-transparent stain that has unique characteristics so the stain POP with color! Great to use on stamped or flat concrete to create a fusion of color. Apply the stain liberally with a brush or sprayer over the stamped surface, allowing the stain to settle in low lying areas to highlight variable color intensities and the surface texture. For best results, move the stain across the surface instead of brushing it in. This will allow the stamped surface to really show the highs and lows of the concrete. Spray Enhancer on top of Endura Solid Stain to get a layered effect and add depth to the concrete. Use a pump sprayer or airless sprayer to spray Translucent Stain on the existing dry stain. SmartSeal WB, Endura AU 25 & Endura AU30 Concrete Sealers are water-based concrete sealers that dry quickly and once cured, create an abrasion-resistant film that provides weatherproof protection against sun, rain, most acids, industrial chemicals, hot-tire pickup, oil and grease. Apply sealer using an HVLP sprayer, brush, roller or microfiber pad. 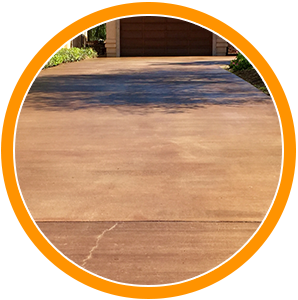 For smooth & brushed concrete, you can spray, brush or roll sealer. Apply thin even coats. Do not exceed 2 mils in thickness. If puddling occurs, immediately brush or roll out the sealer. Additional coats may be added over existing Endura AU coats for ongoing protection. Apply a fresh coat of Endura AU every 2-3 years depending on the traffic of the concrete. Endura AU25 may not need to be removed or stripped before follow-up maintenance application of EnduraStain and other NewLook stains.